Correspondence to Senator Albert Gore, Sr. from behavioral science faculty of Middle Tennessee State University supporting Gore's stance in opposition to continued U.S. involvement in the Vietnam conflict. 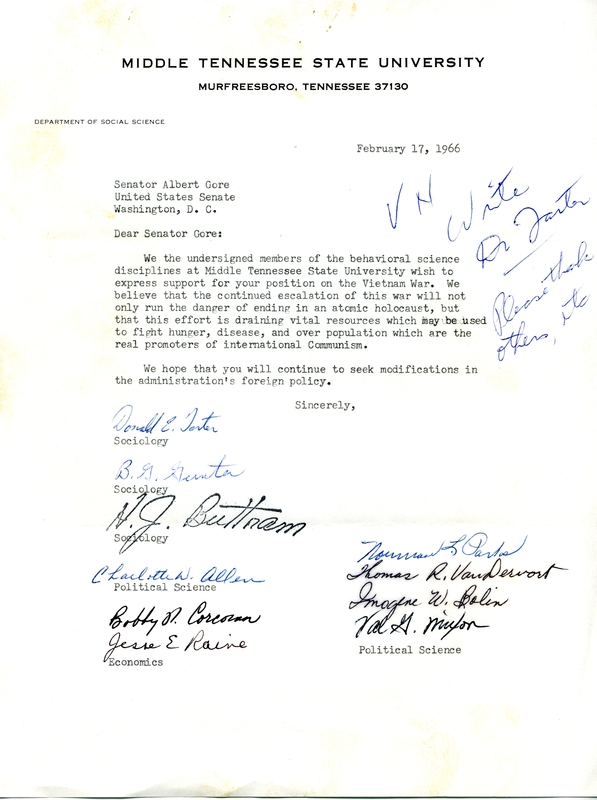 The letter is on MTSU letterhead and gives several reasons faculty oppose the war. Gore, Albert, 1907-1998. "Behavioral Science Faculty Correspondence." Albert Gore Sr. Senate Papers, Issue Mail, Vietnam, 1966, Folder 1, Albert Gore Research Center, Middle Tennessee State University, Murfreesboro, Tennessee. Accessed 19 April 2019. http://acsc.lib.udel.edu/items/show/295.